Today I picked up a bottle of Boulevard Brewing's Tell-Tale Tart, "a slightly sour ale" playfully named after Edgar Allan Poe's short story. 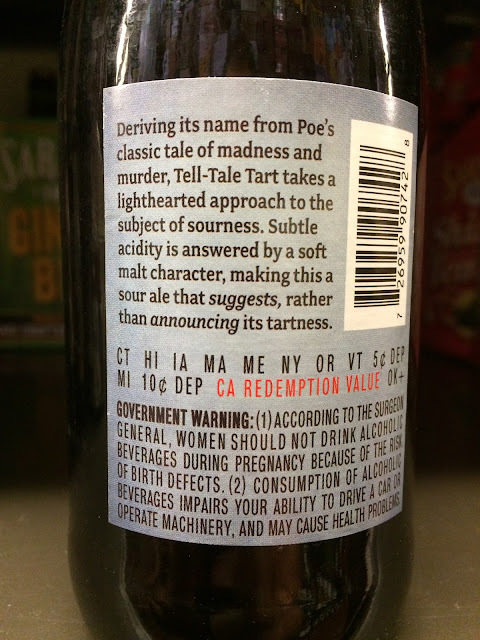 In a short story of their own on the back label, Boulevard describes its approach to this beer, looking to make "a sour ale that suggests, rather than [announces] its tartness." Tall, skinny bottle. Best By 12/07/15. 6.2% alcohol. Since this is a Smokestack Series beer, I poured Tell-Tale Tart into my Smokestack glass. Fruity, candied-lemon tart aroma. Tart cherry and lemon and unripened grape flavors come at the beginning, lightly acidic. Noticeably tart but definitely subtle by "sour" standards, very approachable. In the background, a sweeter backbone adds some balance, maybe prunes or some richer fruit. The back-and-forth, tart then sweet profile is pretty nice. 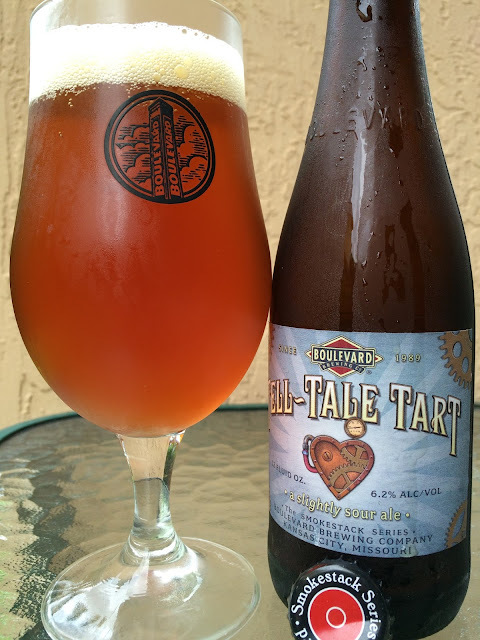 Tell-Tale Tart cleanses the palate, delivers lots of interest, and I spent the entire beer trying to figure out the nuances. A "Tale of Madness!" As promised, a non-blurry replacement photo from a trip to the liquor store!